DENVER, CO – Are you coming to Denver on July 11th for Drums Along the Rockies? If so, why not plan a whole weekend in the Mile High City? » If you haven’t yet purchased tickets for Drums Along the Rockies, you may get them here. 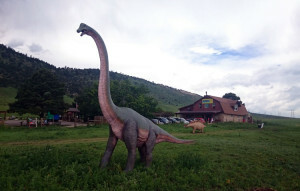 A giant brontosaurus welcomes visitors to the Dinosaur Ridge Visitors Center. Red Rocks – Red Rocks Park, home to the famous amphitheatre, features some incredible hiking trails that offer awe-inspiring sights. For anyone who wants the true Colorado experience, Red Rocks is a must. Dinosaur Ridge – While not quite as dangerous as Jurassic Park, Dinosaur Ridge offers many fun activities for everyone including indoor exhibits, big replica dinosaurs, and unique hiking trails that feature footprints and plant fossils. You can even visit the Bone Quarry, a special location where the first Stegosaurus was discovered in the late 1800s. If this jug was filled with milk, it would hold almost 6,500 gallons. Pie Hole – This pizza place on Broadway Street features delicious New York style pizza pinball, and paper plate art. Every day, Pie Hole features four unique slices of pizza they feature each day. These featured slices of pie may at first glance seem weird, (e.g candied bacon, pineapple, and jalapeno) but upon that first bite, you’ll be surprised at how tasty it is. 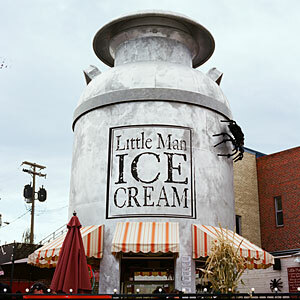 Little Man Ice Cream – Just a short drive away from Sports Authority Field is a 28 foot milk jug where you’ll be able to treat yourself to the some of Denver’s best ice cream. Little Man also hosts free events almost every day, so you could stop by on Friday to see a free movie, or participate in yoga sessions in the morning. When you visit Little Man, the building isn’t the only unique thing about this place. Lakeside’s “Tower of Jewels” looms over the park at night. Casa Bonita – While this could also fit in the food section, Casa Bonita is certainly a lot of fun! Established in 1974, Casa Bonita has been a staple of Denver and is the last remaining location of the former Mexican food chain. Popularized by South Park, this quirky restaurant is a must-see. 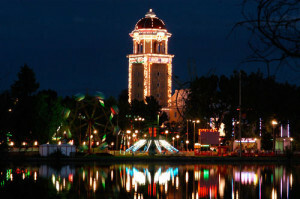 Lakeside Amusement Park – A cheaper alternative to Elitch Gardens, Lakeside Amusement Park has operated since 1908. You can ride the original carousel that is old as the park itself, or the Cyclone, one of the few remaining pre-WWII roller coasters in the country. 220 Broadway Street – While you won’t find much of interest here anymore other than a KeyBank, this location was the site of the Fred and Fae Talent School. Fred and Fae Taylor taught music at the school, and the drummers Fred taught here would go on to become some of the very first Blue Knights. The white horse statue known as “Bucky” was moved from Mile High Stadium to Sports Authority Field. JeffCo Stadium – Located on the intersection of Kipling and 6th Avenue, this field was the location of the very first edition of Drums Along the Rockies in 1964. Now the event is held at Sports Authority field. It serves as a reminder of the humble beginnings of the Blue Knights and the drum corps activity. 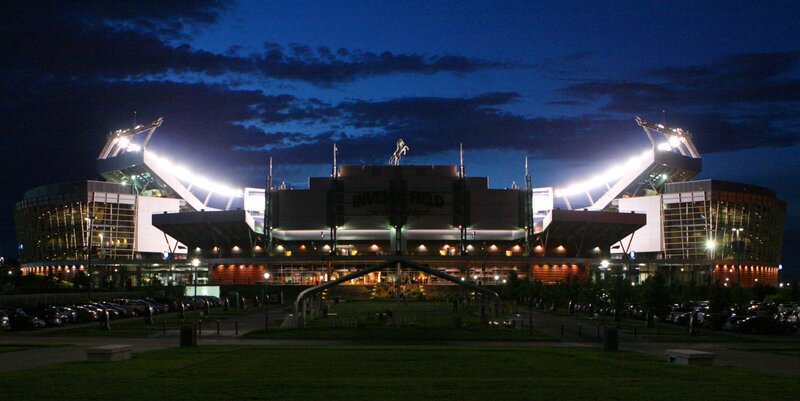 Mile High Stadium – While you won’t find this historic building, it’s memory lives on through the newer Sports Authority Field. It was the location of the DCI Championships in 1977 and 1978 where the Blue Devils and Santa Clara Vanguard won, respectively. If you walk around the parking lot J, you may be able to find a home plate painted into the pavement. 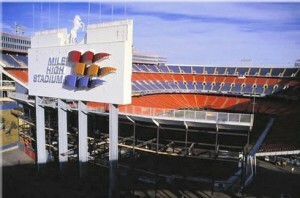 This is the exact location of home at the old Mile High Stadium. More recently, the 2004 DCI Championships were held at Sports Authority Field (then Invesco Field) where the Cavaliers took the top prize. » Need tickets to Drums Along the Rockies? Get them here.